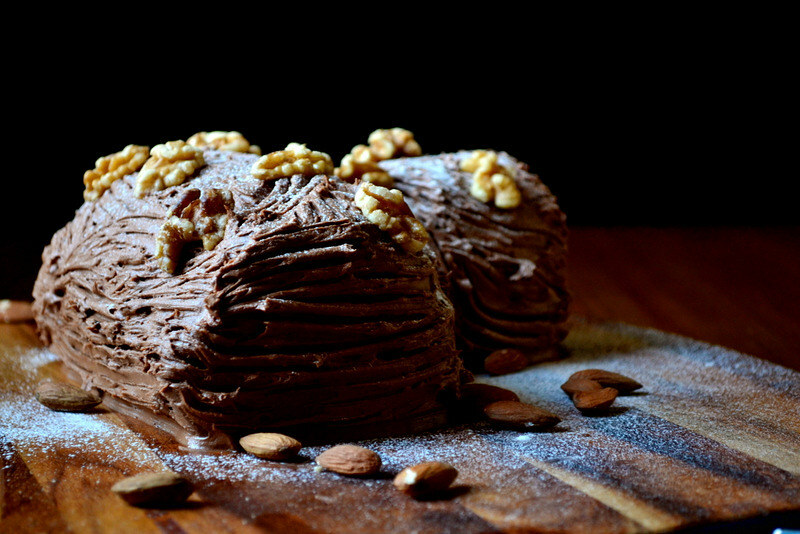 Essentially a generously decorated chocolate Swiss roll, the Bûche de Noël was first popularised as a cake by Parisian bakers in the 19th Century. The history of the yule log, however, is rooted in Iron Age paganism and the cleansing of the air during the winter solstice in December. 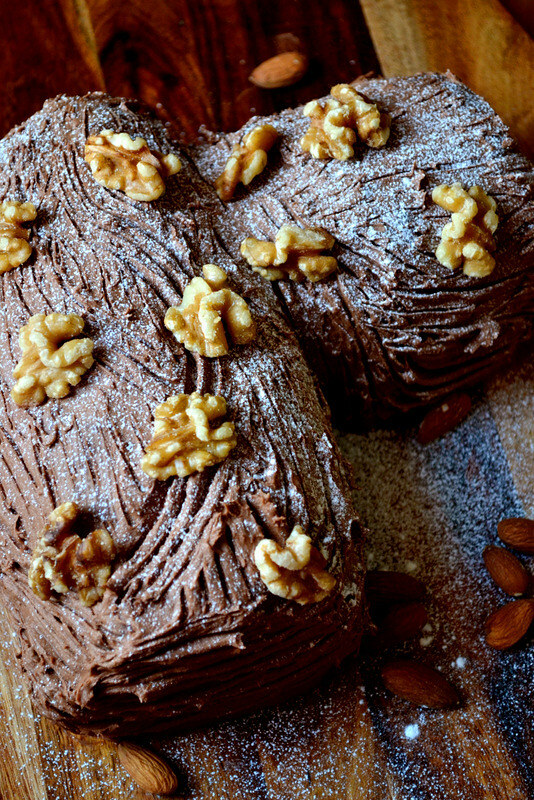 Still, since that sort of behaviour is – mostly – behind us, the light sponge and rich decoration of this yule log recipe is where we’ll busy ourselves. 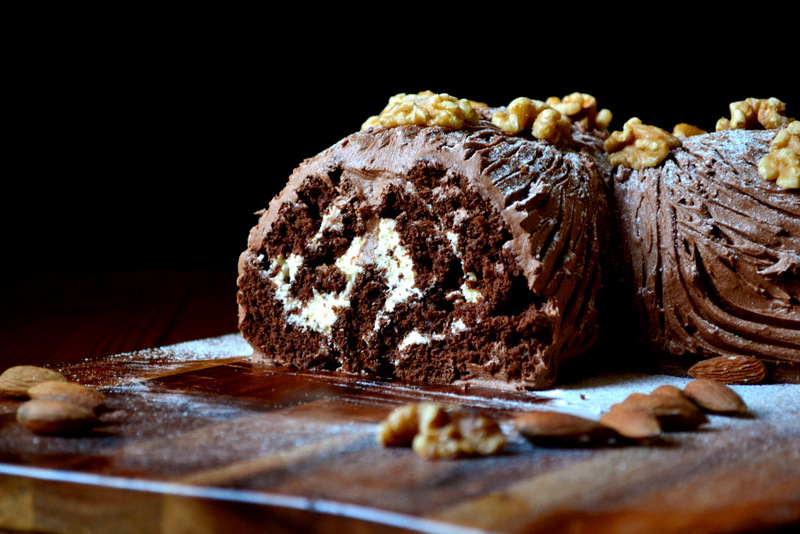 Being a Swiss roll, there is in a Bûche de Noël a fantastic contrast of textures between the dense cream and buttercream and the light, airy sponge. The sponge is, of course, more-or-less fatless, meaning the cake – despite its use of cream and butter – never becomes too sickly or heavy. Not resting like a breeze-block on your stomach. 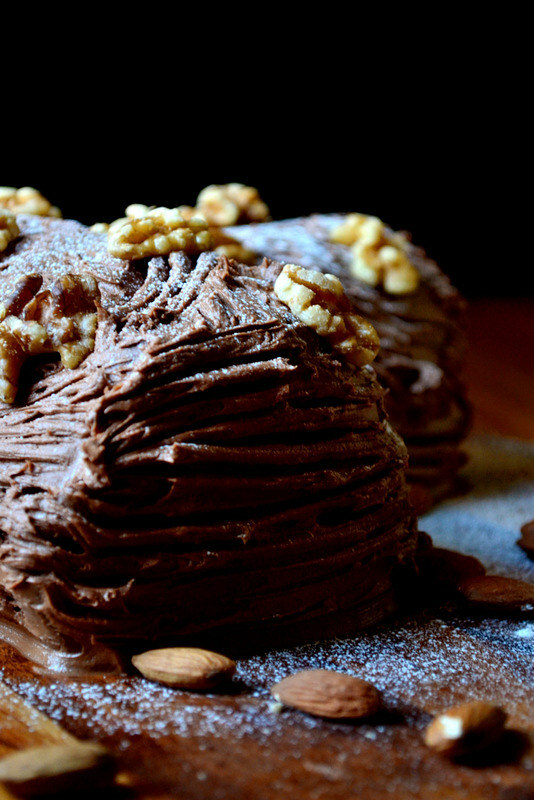 How you decorate your Yule log is entirely up to you. I’m not one for enthusiastic decoration, and so opted for relatively mute walnuts and almonds; a sort of forest-like feel. Decoration must be applied, however, and holly is likely the most popular choice. With 10 steps, the recipe below may appear daunting, but once you’ve got your sponge rolled it’s all very simple. The icing of the cake, in particular, is incredibly pleasing and almost makes you wish you had become a plasterer. For more alternative Christmas cake ideas, see my recipes for a classic Stollen, biblical Scripture Cake and somewhat unique Mince Pie Cake. Oil and line a Swiss roll tin (34cm by 24cm). Lightly oil and sugar the top of the greaseproof paper. Preheat your oven to 200C/180C (fan). Crack the eggs into a large mixing bowl, followed by the sugar. Beat with an electric whisk for 10 minutes, until light and fluffy. Fold the flour and cocoa powder gently into the eggs until fully incorporated. Transfer the fluffy batter to the prepared tin and carefully smooth to the edges. Bake the sponge for 7-10 minutes, until springy. Turn out on to another layer of greaseproof, sprinkled with sugar. Score the bottom of the Swiss roll about 1 inch from where you intend to start. Roll the sponge up tight, keeping the paper in place. Leave rolled up until cool. Meanwhile, whip the double cream in a large bowl, being careful not to over-whip and make it stiff. While still rolled, cut a quarter of the sponge from the end on the diagonal. Unroll, remove the paper and spread each piece with the prepared whipped cream. Melt the chocolate gently using a bain marie and set aside. In a large bowl, beat together the butter and sugar until light and fluffy. Incorporate the slightly cooled chocolate. Gently roll each cake into its intended shape. Position the “branch” either side of the main roll until it looks roughly as intended. Using a palette knife, spread the chocolate buttercream over the cake until evenly covered. Score with a fork and dust with icing sugar. Decorate as you please and serve. Cost: Though a large cake, this recipe for Bûche de Noël uses relatively few ingredients; eight, to be precise. This means that the cost to make it is perhaps lower than you’d have imagined. Indeed, the entire log and branch can be made for a mere £3.40. That looks and sounds a brilliant buche de noel. Thank you, Kay! It went down very well indeed. Especially with ice cream. That looks delicious – I really must make one this year! Please do, it’s very simple really. Lovely recipe and I just LOVE the simplicity but graceful beauty of you decoration. My niece, (who was my partner when we ran a bakery/restaurant, and a fine baker herself), goes absolutely mad when she sees a Buche de Noel over-dressed with meringue mushrooms, etc. I must show her yours. Sounds like a grand idea to me! Looks amazing – haven’t made one for years…am feeling inspired! I do love ganache, in it’s correct place & this light sponge doesn’t require it, you’ve decorated it perfectly to my liking. 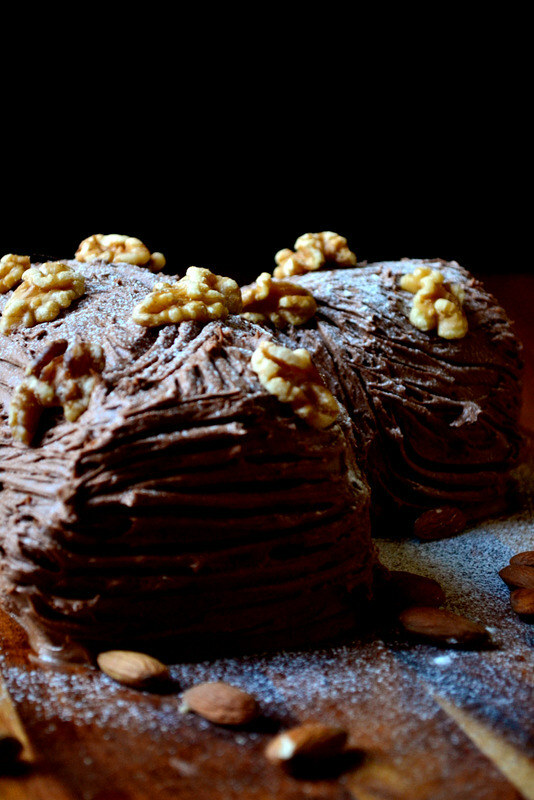 The cream filling & butter-cream covering, dredge of icing sugar, almonds & walnuts, what more could it possibly need? Nothing, it’s pretty gorgeous as it is. Lots of cakes can be spoiled in my opinion, by far too much decoration when there’s no need when the results are like yours. Well done on a beautiful recipe & finished result. Mine tasted very good & I was extremely pleased with the result, my only wish was that I had made two, as they were first to be finished. Speaks volumes…Must make another soon, as keep getting requests from family & friends to make them one even though the holidays are over! I will make a few, have a baking day & ensure that I keep one for just us to enjoy, I only got to taste the end piece that I cut off, better luck this time.